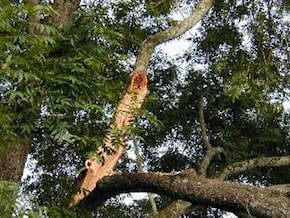 Strong thunderstorms, especially tropical and hurricanes, can cause significant tree damage here in north Florida. Widespread tree damage can occur throughout the region and be a nightmare for most property owners. For most home and business owners, the damage to their trees can be beyond their desire and/or ability to clean-up. Further, such clean-up efforts can be dangerous too given the size of the trees and the potential for further property damage. And to add to the difficulty, most tree service companies in Ocala will be overwhelmed with business making timely clean-up almost impossible. And even if you can find a tree service that is available, many tree care businesses will unethically inflate their prices during these storm aftermath situations, making clean-up costs exorbitant. At Ocala Tree Service, we augment our staff during these time to make ourselves to all of our existing and new customers, and we NEVER INFLATE our prices during storm damage periods. Further, we offer our restoration services 24x7 and seven days a week to get your property cleaned-up and back to new. As soon as you experience storm tree damage, call us for a quick, no cost estimate. We will have one of our lead estimators at your property promptly to go over the storm damage restoration efforts required. We will provide you a fast on-the-spot estimate followed-up with a written estimate via email. We can then get you schedule the same day and often have a crew on your property within 24 hours of your first calling us. When our team arrives, they will review with you the job order and then quickly get to work to clean-up fallen trees, broken limbs, and other storm-related tree and landscape debris. We will remove all the wood, or if you desire, cut it into three-foot segments and stack it anywhere on your property. For small branches, we will dispose of it via our wood chipper and haul it off, or again if you desire, place it anywhere on your property for you to use as mulch or compost. If you are considering cleaning-up your own tree damage, consider the equipment and skill necessary to deal with downed mature trees. The work most often exceeds the typical property owner's equipment and ability. Further, taking on larger efforts can take days or weeks if you have only one or two people to work on it. Please do not waste your time, money, and potential well-being - call Ocala Tree Service to make short work of any sized storm damage you may incur. We have the experience, equipment, manpower, and credentials to quickly, efficiently, and cost-effectively remove all tree damage from your property. Further, we are insured and licensed so you are protected as a property owner for any clean-up liability that may occur. ​Remember, you still have a choice when it comes to Ocala Tree Service. While you may think you need to go with the first tree company that has availably given every other tree company is booked weeks in advance. Just call us to discover you still have an excellent professional choice when it comes to responsive, immediate tree storm damage services. We won't price gouge or otherwise treat you unfairly during your time of need. We back up all our tree services, to include 24x7 emergency tree service, with a 100% customer service satisfaction guarantee.